In the summer of 2012, Antioch University New England environmental education graduate student Maisie Rinne worked with us to determine the many steps necessary to obtain nonprofit status for Distant Hill Gardens. Distant Hill would become eligible for public and private grants. Any contributions to Distant Hill Gardens would be tax-deductible. These are both very important benefits to the possible future funding needs of Distant Hill Gardens. However, we learned that in New Hampshire, a nonprofit's Board of Directors must have at least five voting members, none of whom can be related by blood or marriage. Both of us could not be on the board, and the decisions for the future of Distant Hill would not be ours to make. The Board, and not us, would have complete control of the day to day running of the organization. Because of this fact, we have decided not to file for 501c3 status at this time. We are not comfortable giving up control of Distant Hill just yet. Please Note: Distant Hill Gardens is a not-for-profit organization. We are just not a Federally recognized 501(c)3 non-profit. All donations received go directly to making Distant Hill Gardens and White-Rock Woods (our public trail and nature play area) more accessible to all. 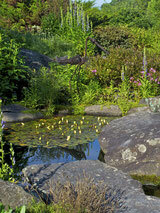 However any donations to Distant Hill Gardens are not considered tax deductible by the IRS. In order to make the natural resources of Distant Hill accessible to everyone, we developed a partnership with ACCESS, a non-profit organization serving the Monadnock Region. It helps people with disabilities create meaningful lives through Education, Employment, and Community connections. In the fall of 2013, Distant Hill Gardens, through ACCESS, received a trail building grant from Q2C, the Quabbin to Cardigan Partnership. A small group of students and teachers from ACCESS, helped us build our first 'Trails-for-All' to one of the nine vernal pools on the property. We received a second grant in the spring of 2014 through ACCESS to help us continue the work on the trails. The long range plan is to connect as many of the vernal pools with accessible trails as is possible. And in the spring of 2015, we partnered with the Cheshire County Conservation Commission (CCCD) to apply for yet another Q2C trail grant. This will supply the funding necessary to complete the half-mile long accessible trail we began in 2013, develop a GIS map of the property, and install a kiosk and a number of interpretive signs describing the important natural resources the trail gives access to. Another funding source we are looking in to is the possibility of establishing a non-profit 'FRIENDS OF DISTANT HILL GARDENS'. This would secure the financial advantages of a nonprofit without having to relinquishing control of Distant Hill Gardens to a board of directors.